People all over the world were heartbroken to hear of Nancy Garden’s death in June. The Golden Crown Literary Society (GCLS) was only weeks from presenting her an award for her beloved 1982 novel Annie On My Mind. Thousands upon thousands of kids worldwide found understanding of themselves or others by reading the classic young adult romance between two teenage girls. Annie made a difference in adult lives too. I fell in love with the book in my forties; what a comfort it would have been to read it at age 15! Nancy grew up in New England and New York. She worked in publishing and wrote ten books before Annie, thirty-five in all. Her lifelong partner, Sandra Scott, survives her. Nancy has been honored by numerous awards. According to her website, Annie On My Mind was banned by the Kansas City school system in 1993 and burned in demonstrations. Courageous students brought a First Amendment lawsuit in 1995 and won two years later. Not to be deterred, Nancy began yet another career and became an avid speaker on First Amendment rights. That was my early story too; I found the same ambition and inspiration from Hall’s book. I had the opportunity to work with Nancy’s GCLS acceptance speech, inserting her handwritten edits. There is no way to express how moved I was to be trusted with the task, to handle her words. What an incredible honor, experience and sad pleasure. There were no Nancy Garden books when I was 16, but “Annie” has been around for other lesbians for 30 plus years. I wondered what readers might say about the book today and thought I’d let them speak for themselves here. Their Twitter comments over the past few years attest to the amazing longevity and power of Nancy Garden’s enchanting and enlighten storytelling. >This is so dumb but i found a copy of Annie On My Mind at the library in seventh grade and was horrifascinated by the cover & stole it. >I see why this book has been so frequently challenged & I adore it all the more! >Did you discover Annie On My Mind as a teen at the public library, like me? Were you scared to check it out, but did anyway? >the reaction of Liza’s friends, of her family, or her teachers, of her school to the character being gay …Garden made it so real, and I couldn’t help but cry at how unjust it was. Because even though this is a piece of fiction, it has actually happened to so many people. It was awful, but Garden captured that cruelty and misjudgment perfectly. >Author Katherine Applegate, winner of the Newbery Medal: “Free to a Good Mind”: Left banned book Annie On My Mind in an airport luggage cart. >Annie on my Mind was the second LGBTQ book I read & hid under my mattress. >Author Karin Kallmaker: It’s World Book Day! I recommend a banned book – read something dangerous! Annie on My Mind by Nancy Garden comes to mind. Lots of really narrow-minded people have tried for decades to make sure you can’t read it. Screw ‘em! Read it! >I so loved selling Annie on My Mind when I worked at a bookstore. 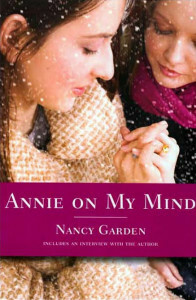 >Nancy Garden’s Annie On My Mind is One of the Most Important #LGBT Teen Novels Ever Written. >I read tht buk wn I ws 12- It gave a realty to something I was feeln. >Author Lesléa Newman tweeted: Paying homage to Nancy Garden by re-reading Annie On My Mind. It’s so good! No wonder it’s a classic. >Went to check-out Annie on my Mind in celebration of a long lived life. All 3 copies were out and I’m 7th hold. Love it!